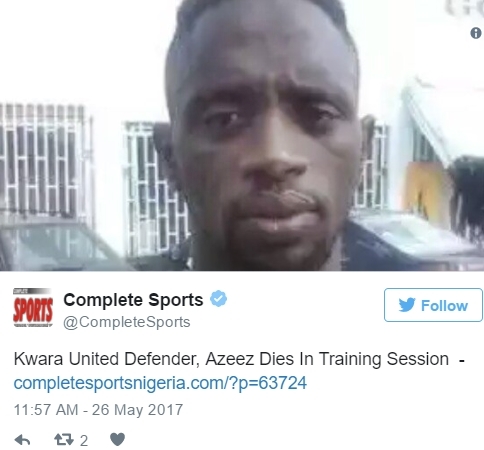 Kwara United FC have been hit with a severe blow on Friday, May 26, 2017 following the tragic death of their defender, Azeez Saka. 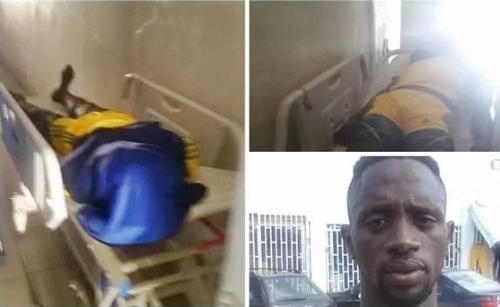 Nigerian Professional Football League side, Kwara United FC's left-back, Saka Azeez, has been confirmed dead after he slumped in training during the club's training session in Ilorin Friday morning. Complete Sports Nigeria reported that the club's coach, John Obuh revealed that Saka slumped, unchallenged during their training sessions on Friday morning and that attempts to revive him proved unsuccessful. "Yes, its true. I don't want to comment any further. He was a good player," Obuh stated when contacted. Abubakar Sylas Yusuf who is a teammate of the deceased also confirmed that Azeez Saka did not show any sign of sickness when they started training on Friday, May 26, 2017. "Yes, I was behind him when he fell on the ground and the thought was that he wanted to rest, but sadly he died afterwards," Sylas explained. It was gathered that Azeez Saka has not played a League game for Kwara United this season in the National League, but was impressive in his team's State FA Cup win over neighbours ABS in May 2017. 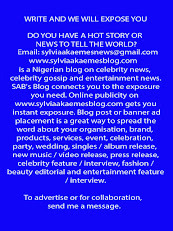 According to reports the late Saka showed no signs of illness prior to untimely and sudden death.